To make your furnishings purchase as easy as possible, we offer the following services after you have chosen your materials. We offer a free, in home measuring and advice service, followed by bespoke quotations for your exact requirements for all our retail customers, this ensures that all measurements and specifications are in a form that we can readily interpret, thus reducing the chances of mistakes due to misunderstandings. Highly experienced seamstresses will make up your soft furnishings, on site, using the best quality linings and interlinings. All our staff have been making home furnishings in a commercial environment for at least twenty years, this experience is used in every project we undertake, from a simple roman blind to the most ornate lined and interlined draperies, curtains, valances and pelmets. Once your goods have completed the making process, with its in-built quality checks, they are finally checked, neatly folded and packaged, full length in heavy duty polythene, ready for collection or fitting. 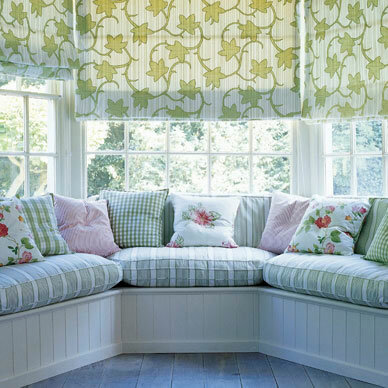 We always recommend that our customers take advantage of our professional fitting service, which is carried out by our full time fitter who has been fitting curtains and draperies for over twenty years. Speed and efficiency (it may take your husband just a couple of hours to actually do the job, but it will take him three weeks to get his tools from the shed and start it ! ).